OREGON, Ohio -- Want to know how family oriented the Maumee Bay Resort is? Right there, coming down the third fairway, was a father playing golf with his wife and 6-month old baby boy along for the ride. While Dad tried to break 100, Mom cradled the infant, fed him baby food, and changed his diaper on the hood of the cart. 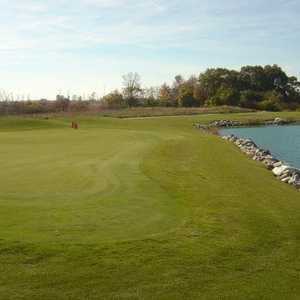 The Maumee Bay Resort golf course is the design of Toledo's native son, Arthur Hills. "We're here for the weekend and I wanted to get some golf in," said dad. "They wanted to come too, so here we are." Now that's some family golf. "As long as they aren't slowing things down, we allow riders to go along," said the ranger from his cart. "The resort is a state park not a golf resort really, but it's not a bad place to play, is it?" The Maumee Bay Resort is the newest state park facility in Ohio and the tax dollars are really put to good use here. The 120-room stone lodge at the resort, with its massive beams and huge lobby windows, sits right on the shores of Lake Erie about 15 minutes from downtown Toledo. And for most people who come here the lake is the center of attention. There's boating and fishing, swimming and hiking along the water's edge. But, if you play golf, the course at the resort is a nice bonus. The golf course is the design of Toledo's native son, Arthur Hills. And that's a good and bad thing. Although Hills' architectural strategy throughout the layout is superb, what it demands of you may be too much for a resort-style course. Even from the white tees, measuring at just 6136 yards, the slope still stands at a hefty 122. Remember, the resort does not focus on golf, so you have plenty of people who come for a few days, bring the clubs, and play their first and last round of the season on this course. That can equal slow play at times. Still, there's much to admire here. The first tee and clubhouse sit about 300 yards from the lodge entrance just west of the lake. It's too bad Lake Erie couldn't have been used as more of a direct feature to this course, but the lake winds certainly remind you how close the lake really is. The virtually treeless terrain begs one to describe Maumee as a links-style course, but without an ocean, and with its cushy fairways and wetlands, it really is not a true links course by strict definition. However, Hills did incorporate humps and bumps in the fairways and tricky pot-style bunkers around the softly rolling layout. The first hole is a rather pedestrian, straightaway par-4 measuring out at 373 yards from the middle tees. But things change quickly. Holes 2-5 are much stronger. The second is the short par-4 with a huge fairway bunker on the left side forcing you to keep your tee shot in the narrow fairway to the right. Stretching out to just 317 yards, a 3-wood or 5-wood might be the suggested play from the tee for a middle handicapper. Oh, yes, don't get caught up in the three bunkers on the right side of the fairway either and stay clear of the native grasses. Losing your ball in that stuff is liking trying to find it in Cindy Lauper's hair. The 361-yard, par-4, third is a dogleg right with a big lake guarding the right side all the way to the green. The 4th is the shortest hole on the course. A bunker-less par-3 with water to the right and an eggplant shaped green. And the 5th hole is the longest at 510 yards. Water hugs the right side nearly the entire length of the fairway. At 100-yards out, the hole takes a sharp skip to the right giving you a view of a green tucked into mounds. The first four holes on the back nine are not particularly memorable. But 14, a snake-like par-5 that slithers around ponds, is easily the toughest hole on the course. Eighteen is also a good finisher. The par-5 is only 467-yards from the white tees, but there are nine menacing bunkers along the fairway and directly in front of the green. 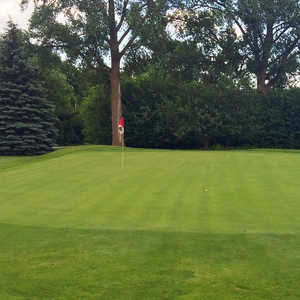 The Maumee Bay Resort is a good spot to mix family and golf, but unlike some family resorts where the golf is an afterthought, Maumee gives the game equal status with all the other available things to do. So, after the fishing, the dip in the pool, or the sand castle building, and you feel like a quick nine, go for it, bring the entire family, and don't forget the diaper bag.